If Google Maps pinpoints traffic congestion on your morning or evening commute, you would avoid the route to save time and most importantly fuel costs. You could do the same with electricity -- use it at the right time and place to avoid high carbon outcomes or high costs. This opportunity is yet to be fully taken advantage of by corporations, according to our new Energy Leaders report, but will soon be much more commonplace given the availability of innovative, data driven energy products and services in the market today. Though there are exceptions, efficiency is seen as purely an operational cost as opposed to an issue of strategic importance. There are consistently low reported investment rates on internal projects, with a median of $50,000 per year and short payback periods of roughly a year, which unfortunately has less impact overall. Energy efficiency has only 23% of the carbon impacts in spite of being 60% of of the reported climate actions by companies to CDP. Energy efficiency may not be helping decarbonise the wider electricity and energy system in markets where we bring on more intermittent renewables or distributed energy resources like electric vehicles. These put additional pressure on today’s grid, driving up ‘peak’ load and contributing to more unpredictable load ‘shape’ which requires energy demand to be able to be flexible -- shifted or stored as in our google maps analogy -- to match the times when the sun is shining. For instance, in California, aggregate data on retrofits shows that buildings are saving energy overall, but their load ‘shape’ remains the same -- inflexible -- peaking at those times when solar isn’t available. In short, companies individually aren't getting the value they should out of energy efficiency projects, and in aggregate their actions are not designed for the integration of renewable and distributed energy resources. Their procurement actions are falling short of the ambition to reach an under 2-degree pathway. However we do see early signs that companies -- particularly leading brands -- are beginning to change this. They are rolling out dedicated resources to procuring renewable energy and are interested in buying ‘energy flexibility solutions’ such as storage and demand side response. They are beginning to see the value in working with startups or to create new partnerships to support market transformation of energy systems more broadly. Our challenge is how to learn from the leaders, and transfer or scale those solutions across sectors and economies. It may not be a surprising recommendation, but reporting and setting targets does matter. Energy productivity is a metric that links core business to energy, and is becoming more popular among early adopters and leaders such as Johnson Controls and Mahindra and Mahindra through the EP100 campaign. Companies making this type of commitment show there is value at stake in doubling energy productivity. 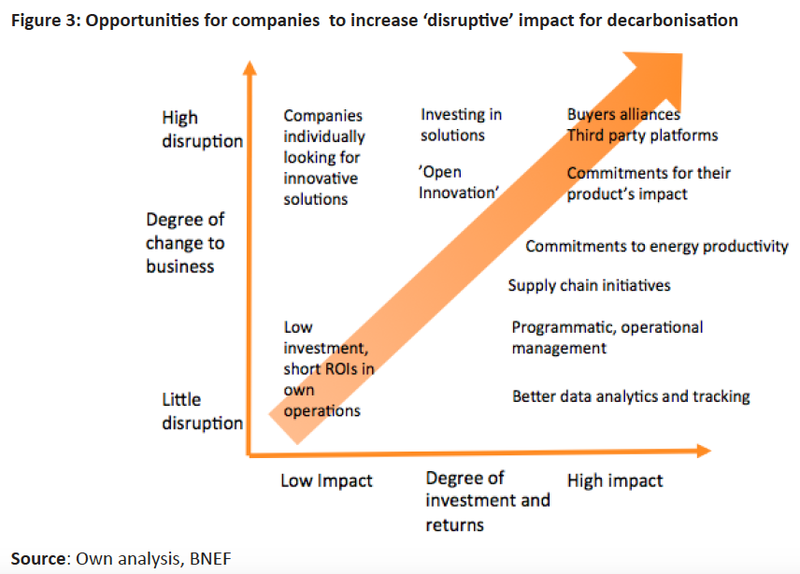 They not only find savings, but opportunities to improve their products and services, and ideally find new business models that drive their customers along the same decarbonisation pathway. Covestro, a materials company, can design lighter weight components for vehicles or aircraft. By acquiring or partnering with new entrant companies, energy utilities such as Enel can unveil new demand shifting services that help them save operational costs but also improve customer retention. (see the Energy Leaders report where we highlight a range of recommendations for companies). No company today is untouched by the fact that energy, how is it is produced and consumed, is under major transformation. To keep up with that, they will need to seek external expertise and watch for new opportunities, such as joining buyers alliances, working with third parties, committing resources to open innovation and adopting and investing in flexibility solutions.